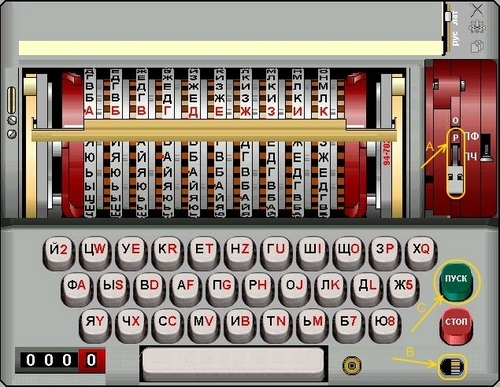 The Fialka emulator used in game can be downloaded from the site below. Whether decrypting or encrypting, you should reopen the program each time to reset the rotors. A quite good page on WWII and Cold War electro/mechanical cipher machines can be found here if the topic interests you. Click the lever (A) twice so the P is showing. Click the button (B) at the bottom right of the Machine. Select the coded text (saved as a .txt file using notepad) to decrypt. Then click the green Button (C). Click the lever (A) so that the 3 is showing. Select the Text File to be Encoded from the Menu.